Once past the Zoji-La Pass, 12,400 ft., the change is dramatic and stark. The green valley becomes barren and awesome. The air becomes brisk, then warmer, Now you are a little closer to the skies. The once forbidden land of Ladakh unfolds itself. Small villages with towering monuments of granite; gravel mountains encompassing them- mysterious yet magical... THIS IS LADAKH, Rooftop of the World. The average height ranges between 10,500 ft. to 13,000 ft. above sea level. The landscape gives us the impression of being somewhere on a lunar surface, brown mountains contrasting deep blue. 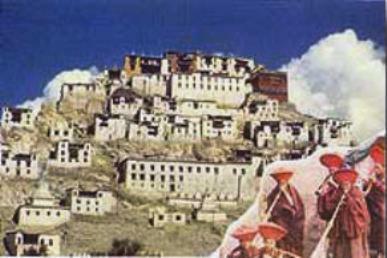 A thousand years ago Leh was the commercial center of central Asia on the Silk Route'. This is the route that Genghes Khan, Alexander the Great, and Marco Polo once passed. 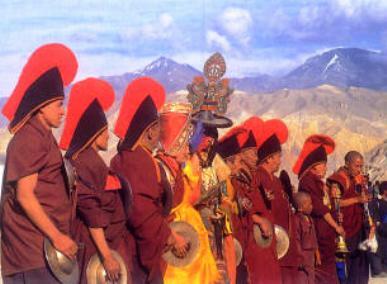 The greatest attraction of Leh is its Buddhist culture, similar to Tibet with monasteries carved into the hillsides. It is a land of magnificent statues of Buddha in precious metals studded with prismatic stones; rich art treasures; timeless Thankas and forceful murals with tantric symbols, signposts of a glorious culture long gone. In Leh we'll visit the royal palace of the Erstwhile King of Ladakh, Hemis Monastery -the largest in Ladakh. It contains a number of gold statues and Stupas decorated with precious stones and a superb collection of the Thankas, including the one that is largest in existence. Hemis Gompa is the home of the three stories high statue of Buddha. We'll also meet with the Monastery's resident Lama if permitted. 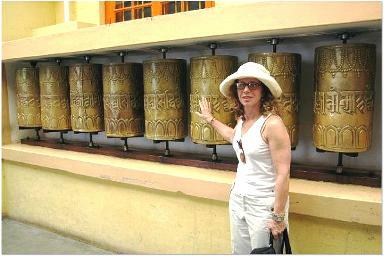 Afterwards proceed to Aichi & Likir Monasteries, which house statues of Buddha and 1000 year old religious wall paintings. On the exciting drive along the zigzagging highway towards Kargil we'll turn into Suru Valley and cross the Pensi La Pass into Zanskar on a hill rising dramatically. Before we start our trek from Padum we'll have a day to explore Kargil and its rural life and to acclimatize ourselves. You will experience the virgin beauty of this desolate rugged mountain range and its cheerful inhabitants the Zanskaris as we call them, who welcome us with smiles and prayer wheels along our route. Definitely an experience to treasure. During your entire adventure trip you will be accompanied by our expert mountain guide, chef and support staff to make your adventure a pleasant experience! Welcome aboard your jumbo jet flight to Delhi, your voyage to Ladakh travel, enjoy the regal hospitality by silk sari clad hostesses. Indulge yourself with delicious Indian and Continental cuisine. This evening arrive in Delhi, where you'll be received and escorted to Hotel Taj Palace/ Hotel Ambassador. Morning at leisure. Afternoon tour includes, the Presidential-Palace, Parliament House, India Gate, Qutab Minar Tower, Jantar Mantar, and the fashionable Connaught Circus. Red Fort, Chandni Chowk, Mahalaxmi Temple and Mahatma Gandhi Samadhi. Evening free. After breakfast flight to Leh. Leh is main center of Ladakh, located in small valley just the north of Indus valley. Today is free for complete rest for proper acclimatization to the high altitude atmosphere. to find that Lamayuru is a scruffy little place. The gompa completely shadows and is the most famous spectacular monastery in Ladakh. Alchi and Likir Monasteries, these two monasteries are located near Saspal on the Srinagar-Leh road. They house many gigantic clay statue of Buddha in various forms. The primary attraction of these monasteries is, their 1000-year old wall painting which makes it a very rewarding experience. with the nunnery of Julochen and the gompa of Rizong. The gompa, belongs to the Gelukpa. Spituk Monastery, just before Leh on the Srinagar-Leh road on the hilltop overlooking the Indus, the Spituk monastery boasts not only of some prized tankha, but also a chamber with enormous statue of Kali, whose faces are unveiled once a year. The chamber contains an ancient collection of face masks too. It houses of 135 yellow capped monks. Drive to Kargil. Sightseeing of Kargil, visit the Tete Sping and other interest places the Suru Valley which form the main stay of Kargil district. Lying nestled along the northeastern foothills of the Great Himalayan wall, it extends from Kargil town, first south ward for a length of about 45 miles up to the expanse around Panikhar, then eastward for another stretch of nearly 50 miles up to the foot of the Penzila watershed where the Suru River rises. The steep barren hills now stretch to the snow line. As the snows melt, the waters flow freely down into the heavily irrigated valleys. Here Tibetan-style settlements thrive. White washed mud and stone houses contrast with deep-green barley fields. Kargil 9,500 ft. 172 miles from Srinagar in the west and 192 miles from Leh in the east, is the second largest urban center of Ladakh and headquarters of the district of the same name. A quiet town now, Kargil once served as an important trade and transit center in the Pan Asian trade network. Numerous caravans carrying exotic merchandise comprising silk, brocade, carpets, felts tea, poppy, ivory etc. 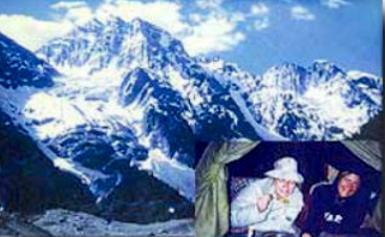 Transited in the town on their way to and from China, Tibet, Yarkand and Kashmir. which the Darads play with particular zeal, resembles our modern polo. After Zoji-la pass we'll drive thru Sonamarg, the gold valley, past winding roads into Srinagar and our abode of luxury houseboat. Cruise through Dal and Nagin Lakes float through a network of canals to the enchanted floating gardens of Nishat and Shalimar; built in the 16th C. by Moghul emperors. Lunch will be served onboard the Shikara (Gondola).Soak in the sun and swim or surf in the lake. This evening enjoy a Wazwan feast (Local multi course meal usually served on weddings or very special occasions). Morning free. Afternoon fly to Delhi, time free for last minute shopping for gifts and prepare for homeward bound departure.